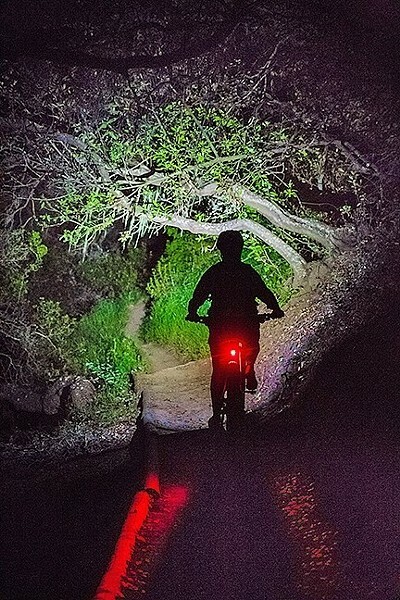 Local hikers, bikers, and trail runners can look forward to using San Luis Obispo open space after dark next winter, as the SLO City Council approved the city's first-ever "night hiking" pilot program on Jan. 16. The council voted 3-2 in favor of the policy—with Councilmembers Carlyn Christianson and Andy Pease dissenting with concerns about wildlife impacts—and the two-year experiment will kick off in November. Through March 2019, SLO will keep 4.9 miles of city-owned trails on the 118-acre Cerro San Luis Natural Reserve (also referred to as Madonna Mountain) open until 8:30 p.m., roughly 2.5 hours later than its current closing time of one hour after sunset. The same extended hours will repeat the following winter. No other city open spaces are included in the new policy, which applies equally to both residents and non-residents of SLO. "My point of view is we struck an incredible balance here," Councilmember Dan Rivoire said following an emotional 90-minute public comment period. "I think this type of pilot program is an ideal way for us to allow some nighttime use and engage and embrace the ongoing long-term stewardship [of city open space]." The nighttime recreation on Cerro San Luis won't go unregulated. SLO will set up a mandatory online permitting system for divvying out a maximum of 65 permits per night. According to a 2014-15 open space study, that's the average number of people already using the mountain after hours. If a hiker, runner, or biker is caught by park rangers on the trails at night without a permit on hand, he or she would be subject to a $561 ticket. Fines are what pushed night hiking to the forefront of city discussions in the first place. In 2015, SLO started more aggressively enforcing its open space ordinance, issuing more than two dozen tickets to nighttime offenders. In August 2016, a group of trail enthusiasts asked the City Council to consider allowing for open space night recreation during the short days of winter, when working people struggle to find time to use the trails legally. It became an issue during the 2016 city elections, and in 2017, the new City Council voted to proceed with the development of a night hiking pilot program. The two-year plan is meant to "test the waters" of night hiking and assess its impacts on open space wildlife. As a way to monitor environmental impacts, the city says it will conduct weekly monitoring of both human and wildlife activity using an "EcoCounter" device, four wildlife game cameras, and a bat detector. City staff will also install two new water troughs, to be fed by a natural spring located beneath the "M" near a lemon grove. According to SLO Natural Resources Manager Bob Hill, the troughs can aid wildlife in finding water if humans disturb their normal patterns at night. "If a wildlife species is flushed out of the bushes because they get spooked or something, this makes it a little easier to find water and maybe expend fewer calories overall," Hill told New Times. Despite efforts to curb the potential impacts, City Councilmembers Christianson and Pease opposed the pilot program, calling the current open space hours appropriate for balancing nature's needs with humans' wants. "I would rather not ask the animals to adapt," Pease said. "I think we ask a lot of them already." Cerro San Luis emerged as the top location for a night hiking program through a process of elimination, Hill said. Open spaces with trailheads in residential neighborhoods were ruled out. Reserves contiguous with larger habitat areas—like Irish Hills, Stenner Creek, and Reservoir Canyon—were considered potentially too disruptive to migratory wildlife patterns. Cerro San Luis has a non-residential trailhead, a well-established trail network, and easier access for emergency vehicles, Hill said. While many local residents lauded the pilot program, others were highly critical of the concept. Some questioned the legal grounds for it, since it's being authorized under the purview of the Parks and Recreation director. SLO's open space ordinance states that it's "unlawful to enter or remain [in open space] between one hour after sunset and one hour before sunrise, without approval from the [Parks and Recreation] director." It's under the director's power that the extended hours were approved, which a group of residents argue clashes with the intent of the city general plan, which designates broader "open space functions" to the Natural Resources manager, which is Hill. "All City Councils since the creation of this position have kept it in administration, not in Parks and Recreation, to insure that open space is not subsumed by the Parks and Recreation Department," read an October letter to the city Parks and Recreation Commission signed by more than 30 residents, including former mayors, City Council members, and environmental leaders.